Eindhoven Airport (IATA: EIN, ICAO: EHEH) is an airport located 7.6 km (4.7 mi) west of Eindhoven, North Brabant, Netherlands. In terms of the number of served passengers it is the second largest airport in the Netherlands, with 5.7 million passengers in 2017 (well behind Schiphol, which serves more than 68 million passengers). The airport is used by both civilian and military traffic. The airport was founded in 1932 as a grass strip under the name Vliegveld Welschap (Welschap Airfield). In 1939 the airfield was acquired for use by the Air Force, as concerns over a military conflict with Germany increased. The airfield was quickly captured by German forces during the Battle of the Netherlands and re-used by them under the name Fliegerhorst Eindhoven. The airfield was expanded and improved by the Germans, with three paved runways and numerous hangars and support buildings being constructed. The airfield was captured by American paratroopers during Operation Market Garden. Damage to the airfield was repaired and the airfield was re-used as an Advanced Landing Ground by both US and British forces under the designation B-78. 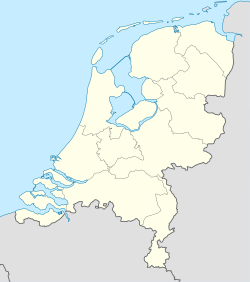 The airfield was returned to the Royal Netherlands Air Force in 1952. It was home to crews flying the Republic F-84G Thunderjet, Republic F-84F Thunderstreak, Northrop NF-5A/B, and finally the General Dynamics F-16A/B Fighting Falcon. 316 Squadron flew the F-16 and was inactivated in April 1994. In 1984 a terminal building for civilian air traffic was constructed, based on a design of Leo de Bever. After the end of the Cold War, Eindhoven was transformed into a military transport base. Initially it was home to F27-300M Troopship aircraft. Over the years to come, Fokker 50, Fokker 60, McDonnell Douglas KDC-10, Lockheed C-130 Hercules and Gulfstream IV aircraft were stationed at the air base. The Fokker aircraft have been retired. On 15 July 1996, a Belgian Air Force C-130H Hercules crashed at the airport – known as the Herculesramp (Hercules disaster). The plane caught fire and in the intense heat, 34 people died. As a result of communication problems within the emergency services the fire services were not aware that the C-130 carried many passengers, which likely caused more people to die than if the emergency services had known about this. On the civilian side, the airport has continued to grow and is now the second largest airport in the Netherlands. To accommodate this, in early 2012 work to further expand Eindhoven airport was started including the addition of a 120-room Tulip Inn Hotel. On the 27 May 2017, the Multi-Purpose building collapsed, this building that was need to serve as a parking garage of Eindhoven Airport. This building was still in construction, the cause of the collapse was a construction error. The floors were made of prefabricated concrete slabs, the connection between the slabs did not meet safety requirements and were not strong enough and with combination with the heat that day the parking building is collapsed. By the collapse nobody injured and died. In October 2018, Ryanair announced it would be closing its base at the airport on 5 November 2018. Construction of a 4 star hotel by Holiday Inn was started in 2018 and is expected to open in 2019. Passenger facilities available include: exchange office, lost property office, luggage lockers, baby changing area, health centre and various shops. A business centre is available too. There are 1,500 parking spaces for long and short term parking. From 1 July 2007, Eindhoven has been the location of the Movement Coordination Centre Europe (MCCE), a merger of the former European Airlift Centre (EAC), established by the European Air Group, and the Sea-lift Coordination Centre (SCC). MCCE is a non NATO/non-European military organization. MCCE is an organization open to all governments whose membership is accepted by all the other participant nations, regulated by a specific legal technical agreement. The mission of the MCCE is to coordinate the use of air transport, surface transport (sea and land) and air-to-air refuelling (AAR) capabilities between participating nations, and thereby improve the overall efficiency of the use of owned or leased assets of the national military organizations. The centre's main focus will be on strategic movements, but not exclude operational and tactical movements. From September 2010 Eindhoven Airport has been hosting the European Air Transport Command, composed of seven European nations who share aerial military assets in a single operative command. EATC will play leading role on the A400M standardization process. Eindhoven Airport is located just off the A2 motorway which offers direct connections to the west and south of the country, including the cities of Amsterdam, Utrecht and Maastricht. The airport is also served by two of Eindhoven's electric bus routes. Line 400 is a shuttle bus service line that connects the airport to its main railway station. Line 401 is a bus rapid transit line that connects the airport to Eindhoven's city centre and its main railway station. Line 20 connects Best railway station and the town of Best with Eindhoven Airport. Also connects the airport with the town of Veldhoven and the High Tech Campus of Eindhoven. Line 10 connects the Eindhoven railway station, the district of Strijp-T (connecting with the Eindhoven Strijp-S railway station), and the Nieuw Acht Industrial Complex with Eindhoven Airport. ^ "Eindhoven Airport - Voordelig vliegen vanaf Eindhoven". eindhovenairport.nl. ^ "Schiphol Transport and Traffic statistics". Schiphol Group. 13 June 2014. ^ "Eindhoven Airport verwerkt meer passagiers | NU - Het laatste nieuws het eerst op NU.nl". www.nu.nl. 2017-12-20. Retrieved 2018-10-16. ^ "Cookies op ed.nl". www.ed.nl (in Dutch). Retrieved 2018-10-16. ^ "F-16 Units - RNlAF 316th squadron". www.f-16.net. Retrieved 2018-10-16. ^ "Leo de Bever & Loed de Bever" (in Dutch). Eindhoven in beeld. 19 August 2015. Archived from the original on 2015-09-23. Retrieved 23 August 2015. ^ "Hercules ramp Eindhoven" (in Dutch). Zwaailichten disaster website. 15 July 1996. Retrieved 22 February 2009. ^ "Construction terminal extension and hotel Eindhoven Airport has started" (in Dutch). kcap.eu. 19 December 2011. Retrieved 2013-01-21. ^ Staff Correspondent (2018-10-07). "Nieuw 4-sterrenhotel Holliday Inn bij Eindhoven Airport". Eindhoven Airport (in Dutch). Retrieved 2018-10-16. ^ "Eindhoven Airport Facilities". Eindhoven Airport. Retrieved 2014-06-14.